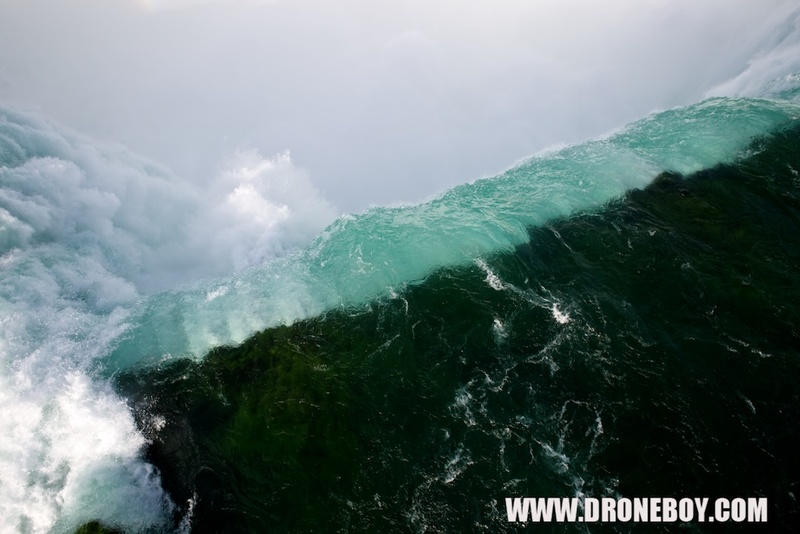 On September 26th, 2015 the DroneBoy team reached a huge milestone by successfully flying and filming beautiful Niagara Falls Ontario. 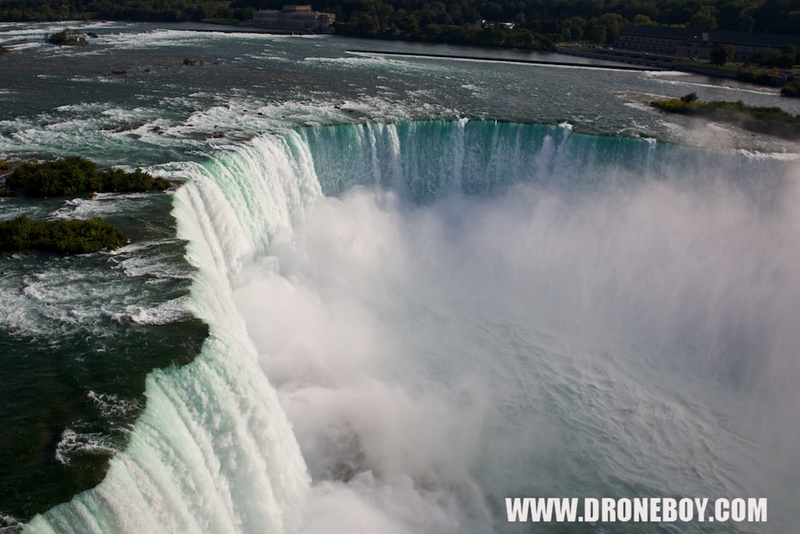 In many ways Niagara Falls is considered one of the “Everest’s” of the drone world. Why? Well, it is a spectacular natural wonder to see and certainly to film, that’s for sure! Drone flights above Niagara Falls are sought after for good reason – the photos and video that can be captured from above the Falls are amazing. Before you pack your Phantom and hop in the car to go there to shoot let’s consider some of the challenges of filming Niagara Falls. It is very, very big and this means long flights from the control station on the ground, which can get a bit tricky. It will be easy to loose sight of your craft, which you can’t let happen; so multiple Observers may be required. Obviously all the flights are over water, which is always a bit of a concern but more so for beginner pilots. We are used to flying over water, and do this all the time, so that aspect is really more of a mental challenge than anything else. Flights above Niagara Falls are certainly fraught with danger due to unpredictable winds, but the new stabilization technology in the drones today mitigates most of these problems for us. One big concern for my team was the massive amounts of moisture in the air. Niagara Falls is a virtual cloud-making machine, atomizing thousands of gallons of water a day into mist and moisture in the air above. Water is NOT GOOD for drones flying overhead and we had to work very hard to stay upwind of all the mist clouds over the Falls. To be honest though, it is not any of the above reasons that make Niagara Falls so difficult to fly… They are all small physical hurdles to conquer on the day and the kind of challenges we deal with all the time. Technology, skill and a well-trained team can easily overcome all theses physical challenges. The biggest hurdle involved in flying Niagara Falls has to be all the rules, regulations, permits, certifications, permissions and clearances involved. We started the process for our particular flight well over thirty days in advance of the proposed operation date, and even at that we only received our final permission a few days before shoot day. Here is a breakdown of the requirements that we needed in order to legally fly Niagara Falls. 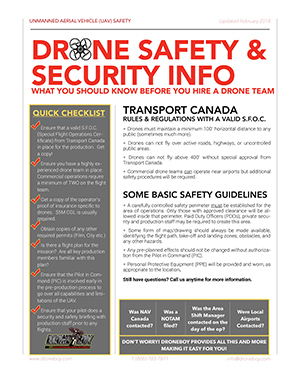 A Special Flight Operating Certificate (SFOC) from Transport Canada – This is a standard requirement for all commercial drone ops in Canada and something we have in place for the province of Ontario and most other regions in Canada. Our SFOC is renewed annually. A CYR-518 special authorization to operate an unmanned aerial vehicle in Class F Special Use Restricted Airspace. The area around Niagara Falls is restricted airspace and a MUCH more detailed flight plan, SOPs, emergency and communication procedures must be filed with Transport Canada before they will even consider letting you fly drones there. Permission from The Federal Aviation Administration (FAA). Permission from the Niagara Police. Permission from The Niagara Parks Commission. In this case a $750 permit. Permission from the Niagara Falls Bridge Commission. Permission from the City of Niagara Falls. After all those permissions and permits were in place we were required to perform a detailed communications and safety briefing with all local air operators. This included The St. Catherines Flying Club, National Helicopters Inc., Rainbow Air, Fox Aviation, Niagara Helicopters and Niagara Falls Air Tours. Days prior to our operation we contacted all these operators to let them know of our proposed flight plan details. On shoot day we let them know when we started and ended our operations over the Falls. As with all flights within three miles of an active aerodrome we filed a Notice to Airmen (NOTAM) 48 hours before the operation with the Flight Information Centre. On the day of the operation we also checked in and out with the Toronto Area Shift Manager. Wow, all that for a few photos and some video. Welcome to the wonderful world of aerial filming with a drone! Have a look at the results and let us know what you think. We think it was worth it.